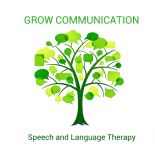 You may be aware that there has been lots going on behind the scenes at Grow Communication, Speech and Language Therapy!! It’s been busy old time and we are well on the way to becoming a fully-fledged Social Enterprise – this means that all profits from our work go back into helping those with communication needs. We’re so excited about this and have lots of exciting projects planned to reach those whose voice needs to be heard! Jude Philip is now joined by the lovely Katy Bennet in this new enterprise. Katy is an experienced therapist and shares my heart for unlocking communication with those that we work with. Working together enables us to combine our ideas and resources, and to be even more creative. Look out for developments, especially around AAC. Together we visit families at home, school or their care setting – but we also work from the Grow Communication clinic. This is our very own dedicated space where we can offer group and individual sessions! At last somewhere to keep all the toys and resources which used to fill our carboots! Keep an eye out for our new logo, website and lots more. And a HUGE thank you to all the families who have supported us getting up and running with GROW! “I’ve been a Speech and Language Therapist since 2003 and LOVE my job. I love finding creative ways to teach new skills, and finding out about all things to do with communication. I’m often to be found researching, reading and finding out about new ideas/ approaches and I love putting these into practice. Those who live with me would agree that my nose is often in a book/journal or manual!! “I started working as a Speech & Language Therapist in 2005 and like Jude absolutely adore what I do! I currently split my time between Grow and an NHS Adult Learning Disabilties Team. Working as part of a multi-disciplinary team has really emphasised the need to look at the whole person and not just consider communication. I’m passionate about figuring out what an individual needs and working with all those around the young person to maximise potential. I get a huge amount of satisfaction from working with families to make the communication environment the very best it can be for their young person. Good at thinking outside the box and creatively I aim to make my input fun and engaging. This entry was posted on October 7, 2017 by judephilip in Uncategorized and tagged ASD, Augcomm, autism, communication, Complex needs, Developmental Language Disorder, grow communication, slpeeps, speech and language therapy.